Radio frequency identification (RFID) has long since arrived in the world of logistics. The AIM-D e.V., an independent association of the global Industry Association for Automated Identification, Data Acquisition and Mobile Data Communication (AIM) responsible for Germany, Austria and Switzerland, will demonstrate the potential of RFID in the context of various material flow processes at the 2019 LogiMAT in a Tracking & Tracing Theater showcase. Fraunhofer IPMS will participate in the showcase, exhibiting how the addition of wireless and battery-less sensors can further enrich Auto-ID processes. RFID continues to make an even greater contribution to the automation of logistical processes. At this year’s LogiMAT, the AIM-D e.V. 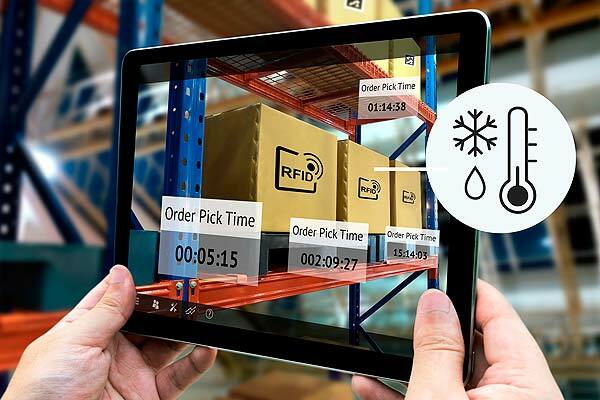 will demonstrate the multiple possibilities RFID can offer to make detection, tracking, or quality assessment in procurement, production, or distribution processes simpler, faster, and cheaper. AIM-D e.V. has invited some of its members to exhibit within the Tracking & Tracing Theater demonstrations during this year’s LogiMAT trade fair to be held in Stuttgart from 19-21 February. Individual steps of how moving objects are tracked with AutoID technologies as well as sensors will be shown in various live scenarios of exemplary production, material flows and logistics process sequences. According to Dr. Weder, Fraunhofer IPMS provides services including consulting, concept development, hardware and software design, as well as implementation support. Particular focus is placed on comprehensive RFID sensor system development, in which RFID technology is perfectly tailored to each respective application, environmental condition, application material, and existing IT infrastructure. Advanced testing of a solution’s suitability can be performed in the context of a proof of concept (PoC), conducted in the corresponding logistic research and evaluation infrastructure at Fraunhofer IPMS testing laboratories. The interaction of the systems involved is based on standardized OPC UA data communication. During guided tours of the Tracking & Tracing Theater, scheduled for 10:30, 12:30, and 14:30, LogiMAT visitors can learn about potential AutoID solutions for their own companies and are provided an opportunity to speak with Fraunhofer IPMS experts. Early on-line registration via the website is recommended. The Tracking & Tracing Theater is located in Hall 4, Booth F05.